Cyber-attacks against companies have increased in recent years and resulted in trillions of dollars of direct losses. Email is one of the cyber-criminals main targets. In addition to the use of inadequately protected digital communication channels, the increasing practice of bring-your-own-device policies has led to the greatest data security risk of our time. Unencrypted email, lost smartphones, unsecure Wi-Fi and mobile networks etc. are all posing risks and making corporate data vulnerable to theft and cyber-attacks. Companies are also affected by strict data protection regulations like the EU GDPR, which can – if not followed – cause big sanctions. BYOD security: Adopt Bring Your Own Device-practice securely! An enterprise may allow employees to download EEZY KEYZ® plugins and apps for one work email address into as many email-enabled devices as they may possess (limited for supported platforms). EEZY KEYZ® makes email business communication safe regardless of where and when you roam, even during weekends and holidays. Fully automated & ease of use Cross-Platform solution: EEZY KEYZ® keeps your organization’s confidential messages and business secrets secure and private. The encryption process is fully automated – employees can continue using their existing email like before but without worrying about email data security. Available for Android, iOS and Outlook. Very strong session and identity based encryption: State-of-the art protection against cyber-attacks and espionage. EEZY KEYZ® end-to-end email encryption software uses a unique (and patent pending) asymmetric and symmetric multi-key encryption technology (3×256 BIT AES and 1×3072 BIT RSA). Each message including its attachments and message-related metadata is individually encrypted. The messages are also automatically digitally signed, providing authenticated communications. Cost-effective: EEZY KEYZ® is an affordable email data protection solution. No need for complicated administrator tools, training staff to use complicated systems or changing email addresses. It is a small investment to prevent the costly email data breaches and GDPR sanctions. True end-to-end encryption: EEZY KEYZ® protects the confidential email data all the way from the sender’s device to the receiver’s device. Even if someone would be able to access your organization’s servers, the email data is useless for the attacker as it is stored encrypted locally and in the cloud. EEZY deployment: Centralized delivery through your organization’s IT administration. Enterprise interface to manage accounts and deliver passphrases. Automated key exchange distribution. Contact our sales to find out more! Breaches in data security are a big risk for companies and can have disastrous effects for a business. Lost business secrets, intellectual property and customer data in addition to the losses related to losing customer loyalty and harmed reputation are a few examples. With the new EU General Data Protection Regulation organizations failing to protect the personal data of EU citizen will be fined up to the €20 million or 4% of global turnover. With EEZY KEYZ® end-to-end email encryption software your organization’s email is protected against cyber-attacks and espionage with the strongest end-to-end email encryption technology. Our software is an easy-to-use and cost-effective solution to secure your organization’s sensitive and confidential email information. The messages are also saved encrypted so your email data is protected on the email server as well. The increasing adoption of bring-your-own-device policies poses a substantial data security problem for businesses. The risk of data breaches increase constantly as employees use their own devices to access vulnerable business information and to handle business communications. EEZY KEYZ® end-to-end email encryption software can be downloaded into as many email enabled devices as needed to make your business communication safe at all times. According to research¹, the most common causes for data breaches are hacking and employee error. EEZY KEYZ® uses a unique (and patent pending) asymmetric and symmetric session and identity based multi-key end-to-end encryption technology (3×256 BIT AES and 1×3072 BIT RSA). Thanks to the individual encryption of the messages, it is practically impossible to hack the system. To do so successfully would require massive interception capacity just to open one single email for unauthorized scanning. In addition, our end-to-end email encryption software is extremely easy to use and install. The messages between users are automatically encrypted, reducing the risk of employee error. EEZY KEYZ® also protects your organization against phishing. According to FBI², companies have lost more than $2.3 billion to CEO frauds alone. CEO fraud is an email scam in which the attacker forges a message from an executive and tricks someone at the organization to transfer funds to the imposter. When end-to-end email encryption is adopted by the organization this is no longer possible. When you receive email protected with EEZY KEYZ® encryption you always know that the sender is authenticated. This security also applies to your partners and customers. When they adopt EEZY KEYZ® email encryption, not only can you safely and securely communicate with the protection of the strongest encryption technology, but you can also prevent the phishing attempts. Receiving encrypted email is always free with EEZY KEYZ® so adopting it to receive your encrypted email does not cost anything for your customers. Our software plugin can be easily added into existing Outlook accounts. 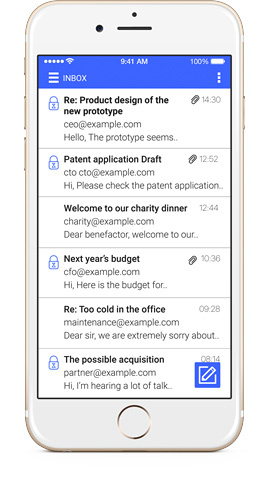 To ensure secure BYOD-practice, our email application (compatible with all leading email services) can be installed for Android and iOS devices as well. 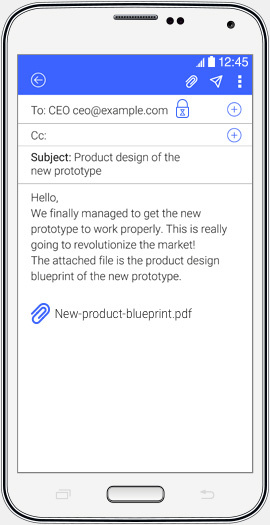 Our end-to-end email encryption software connects to user’s existing email service and automatically encrypts email and attachments between EEZY KEYZ® users into enciphered text. Unencrypted email can be normally sent to receivers who do not have our end-to-end email encryption software. Check our SECURITY page to see more details how EEZY KEYZ® works. 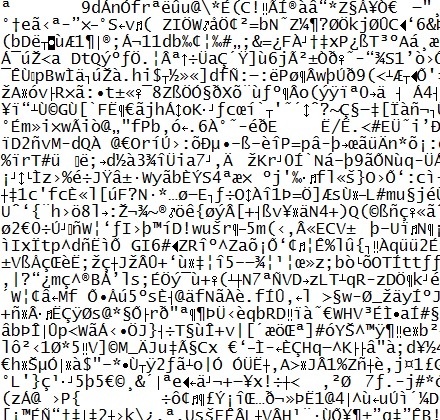 This is an example of how an encrypted message looks like.